Antique Sheffield Crafton 1920s 5 Piece Tea Service includes Large Serving Tray with Handles. 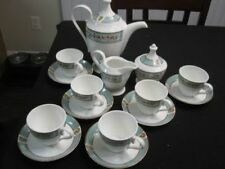 This set belonged to my grandmother who emigrated from England in the 1920s. It was either brought to Boston by her or was given to her as a wedding gift in the early 1920s. As stated in "Collector'sEncyclopedia of Limoges Porcelain third edition by Mary Frank Gatson.". multi-color flowers decorate body in spray designs, with gold trim. On bottom HAVILAND mark 9, H&C/F in Green overglaze factory mark 9- dates to 1878. as stated in Collector's Encyclopedia of Limoges 3rd edition by "Mary Frank Gatson". 6" tall X 4 1/2" wide. Sugar Dish approx. Satsuma Moriage Gilded Tea Set. Japanese Legendary Motifs of 7 Gods of Fortune. (1)teapot is 4” tall to the top of the lid handle, 6 1/4" across from handle to sprout. Floral design, all are marked on bottom in "RS Germany.". on the bottom of all 3 pieces has RS Germany. #Chocolate Pot. This three-piece pewter set consists of a Teapot, cream and sugar bowl with lids. A very unique piece, a round shape with an oak leaf and acorn as the finial. The cane wrapping is loose on teapot handle. ~ c1800's ~ Silver Plate. Antique CHRISTOFLE PITCHER. Signed, Sealed, & Numbered 17(3)2973 (see photos). In antique condition with antique wear. Portion of handle has been removed. Missing handle portion was made of wood. Rare & Elegant Antique Limoges Translucent Porcelain Victorian style pink gardenias at top with gold trim design. "Limoges Price Guide" by Debby DuBay. The Pot is elegant and dainty, the top is decorated with elegant pink gardenia and gold gilt to blend perfect with top of pot! ARTIST: Gibsons England. Exceptional English Art Nouveau/Arts & Crafts Aesthetic. with Platinum Trim ca 1910. Sterling silver 925 S. The item is pre-owned but in superb condition. Only sugar bowl is still in production. Designed by: Henning Koppel (1918 - 1981) in 1952 and 1956. Height: 4.3 cm. Sugar bowl. THIS ALFRED LANTERNEIR LIMOGES FRANCE SET HAS FRENCH GREEN SWAG WITH GOLD WREATHS DECORATION AND LOTS OF ELEGANT SHINE. HAS AN ELEGANT HEAVY GOLD GILT ORNATE HANDLE TO GO WITH THEREST OF THE BEAUTY AND CLASS. ANTIQUE LIMOGES Bower & Dotter Elite CHOCOLATE POT SET MADE OF FINE TRANSLUCENT PORCELAIN. HAS AN ELEGANT HEAVY GOLD GILT ORNATE BEADED HANDLE TO GO WITH THE TOP HANDLE AND CUP HANDLES THAT MATCH. SAUCERS ARE APPROX. Antique Rare Limoges CFH/GDM Haviland France Hand panted Translucent Porcelain Coffee Pot. as stated in Collector's encyclopedia of Limoges 3rd edition by "Mary Frank Gatson". #Chocolate Pot. #Coffee Pot. Type： Tea Pot. Silver Plate Copper. Also note that monitor settings may vary from computer to computer and may distort actual colors. If you buy. ANTIQUE HAVILAND GDA CH. FIELD LIMOGES FRANCE Chocolate Pot GOLD GILTED. under bottom had GDA in green cira 1900-1941 & Ch Field Haviland Limoges in red cira 1900-1941 as stated in. Limoges France White Footed Gold Gilt Chocolate Pot with heavy gold gilt handle. Finnish Silver Teapot - Antique 1835. In good shape; has signs of age, but not really noticeable and is to be expected giving it's from the 60's. 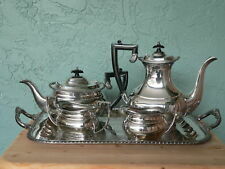 Sterling Silver Four Piece Tea and Coffee Service - Art Deco Style - Vintage (1942). A perfect Chinese Zisha teapot, it is carved p each, the teapot is made of Zhuni, The base has “ Wang Yinxian ” mark, Very nice teapot. A perfect Chinese Zisha teapot, it is carved p oem, the teapot is made of Zhuni, The base has Yang Pengnian mark, Very nice teapot. make Supersized seem small. Get images that. 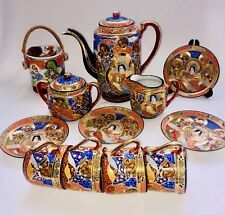 THIS IS A SET WHICH INCLUDES A RARE BOMBAY TEAPOT AND MATCHING COFFEE POT. THE SET IS IN EXCELLENT CONDITION. 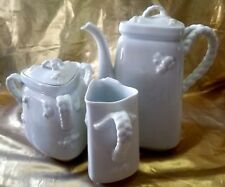 BEAUTIFUL RARE "BOMBAY" TEAPOT & COFFEE POT SET! We Reclaim these treasures to bring to you to be Repurposed and we hope that you Rejoice when your Pardoned Treasure arrives! 3 1/2" wide by 3" tall and the saucer is 5 1/2" wide. Superb English Victorian teapot, handmade & dovetailed; original braided leather handle with repousse detail around original finial. - This beautiful 19th century tea kettle is charming and elegant, with very little wear on either the original leather or finial. A perfect chinese Zisha teapot, it is carved peony flower, the teapot is made of Zhuni, The base has Qianlong mark, Very nice teapot. 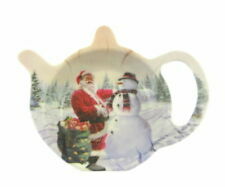 Landers Frary and Clark - Universal Tea Ball Tea Pot. Antique Turn of Century Copper & Brass Tea Pot. wear with age/use. turn of century era piece -1900. ANTIQUE HANDMADE MAROC NO59 Islamic Silvered Brass Teapot BYtn":"K"}">SAEED Banany Production. Dar el ghazal Fas. tn":"K"}">. 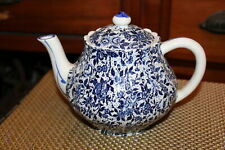 THIS IS A VERY RARE COLLECTIBLE ANTIQUE PV TEAPOT FROM THE OPERA SERIES AND FEATURES ART TRANSFERWARE. OVERATURE BY G. ROSSINI IN FRENCH. IT HAS A BEIGE BACKROUND WITH GREEN & GOLD TRIM. 11 1/4" Round. 1 1/2" Round Base. Sterling Silver Warwick Vase - Antique Edwardian. Perfect chinese famille-rose brush pot painted with two birds are standing the tree, painted very fine, The base has Qianlong mark, Very good brush pot. Item weight: 2.34LB (1060g). Item size: 13.5 13cm 5.31" 5.12". 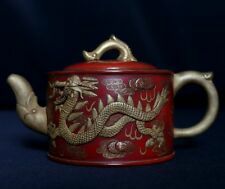 The teapot was made in Kutani and dates circa 1890. The handle is in the shape of a dragon. The decoration is very good and unique. On one side it has a woman standing on a large vase with a scoop in her hand. The pattern roses decorate the graceful Clarion blank. Condition: Mint - Gift Quality It appears to be unused! France Limoges Footed Gold Gilt Chocolate Pot/ Teapot /Coffee Pot. Antique French Limoges B & H (Blackeman & Henderson). 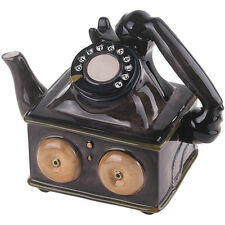 Teapot has the B & H Limoges in green over glaze and. Rare & Elegant Antique Limoges Porcelain White with gold leaf branches design. Large Antique Porcelain Hand Painted 1880's-1890's Chocolate Pot, Coffee, Teapot. #Chocolate Pot. #Coffee Pot. It has lovely colorful fruit with a gold handle and top. Inside of spout and top is iridescent color.